By championing both contemporary and archival music, London's Public Information label creates a micro-context for its releases. Time is flattened, so new music operates in continued dialogue with its antecedents. Unifying otherwise seemingly disparate records in the label's catalogue - all the way from the murky, sleazy synth-pop of Acteurs to early library music - is label founders Alex Wilson and Lionel Skeratt's enduring fascination with experimental electronics and hunger for new sonic experiences. On the surface of things that might make Public Information's commitment to archival reissues seem somewhat surprising, but last year's Electronics Without Tears - a lovingly compiled CD featuring an hour of material from the archive of early electronic music pioneer Frederick Charles Judd - only served to further highlight that dedication to experimental sound. As Wilson explains, "What makes this [mid-1960s] period so interesting is the newness of what buzzed out of tape machines and speakers. Sounds never heard before, technology at the bleeding edge." For Public Information's tenth release, the label taps into the new-old duality at the heart of its aesthetic, reaching an apex of sorts. Interpretations on F.C. Judd features twelve contemporary electronic musicians' studies on Fred Judd's vast archive of lectures, tones, field recordings, rhythms, tape loops and mistakes. Some of the contributors are to be expected: Leyland Kirby, who as both V/Vm and The Caretaker deconstructs and resculpts archaic music into strange new shapes, seems a natural fit for the project, as do library music enthusiasts Ian Helliwell, Nick Edwards (Ekoplekz) and Chris Carter, who used to devour the Judd-edited Practical Electronics and Amateur Tape Recorder magazines in the '60s. Perhaps less predictably, Interpretations also includes contributions from Perc and Bandshell, better known for dread dancefloor music, and Karen Gwyer, whose sticky-warm burbling techno seems the polar opposite of Fred Judd's functional excursions in sound. Even so, all the musicians found something in Fred Judd's work that resonated powerfully with their own. Holly Herndon, for example, was drawn to Judd's voice thanks in no small part to her own experiments with vocal processing and synthesis. In a poetic meeting of contemporary and old, she processed Judd's desiccated East London mumble with his own sound effects. Using ChucK, a fairly young programming language with little documentation and lots of bugs, also "paid some tribute to Judd's commitment to experimentalism," Herndon explains, "which seemed appropriate conceptually, considering the fact I was literally working with these little windows into a different time and context." Where Herndon worked with digital files, sifting through "gigabytes of information" for anything that caught her ear, Nick Edwards' tack was closer to excavation than Herndon's sonic gold panning. "I initially recorded a series of loops by manipulating sounds taken from my personal collection of 7" sound effects records produced by Fred in the 1960s. I just felt it was important for me to engage and interact with some of those original, physical relics," he says. Edwards then digitally edited the loops, arranging them into a tight sequence of concrete events, and added samples from the additional material provided by Public Information, which he used "as sonic 'punctuation marks'." In the resulting track 'Fredwrek', Judd's voice is timestretched into an unearthly groan so that he sounds, as Edwards puts it, "like a ghost, lurking in the wreckage of his own sonic legacy." That tension and interplay between past and present inform all the interpretations to a certain extent; similarly to Nick Edwards' method, Perc, aka Ali Wells, approached Judd's work with a view to exhume the material rather than recontextualise it. He describes the process as "almost like archaeology. The recordings serve to document not just the history of this music but also British life back then." Wells manipulates Judd's voice into something spectral, the vocal and electronic samples of 'Woodford' clattering and reverberating in profound space, so that they invoke the image of Judd himself in his workshop, labouring in profound solitude at sonic minutiae over arcane gear. Karen Gwyer's 'Judd Drums', by contrast, fills the space around the source material not with murky, abstract sound objects but with tippled percussion and lolling melodic lines, using the "fiddly complexity" of Judd's rhythms from 'Drum Song' as a springboard "to have some real fun." Despite the difference between Perc's freeform, somnolent piece and Gwyer's dubby kosmische rework, their archaeological approaches to the archives nevertheless converge conceptually. Rejecting any notion of bringing early electronics up to date, both Gwyer and Wells instead revel in the music's very age, and in "finding something previously thought of as lost from an era now long past." Similarly, Edwards' hypnagogic take on FC Judd's material has plenty in common with Mordant Music's, whose 'Hoarded House' loops a vocal sample. "I no longer exist," it says drily, a dual comment on immediate mortality and the self-evident immortality of the library archive. Leyland Kirby and Bandshell's adaptations also dwell strongly on death. In their leaden reworks, samples from the Judd archive drift amid thick, lugubrious clouds of bass and abrasive noise. If anything, all these parallels underline how truly experimental music, no matter how archaic the technologies used to produce it, never really becomes obsolete, instead acquiring a patina that if anything increases its appeal to modern audiences. Interpretations is, perhaps unexpectedly, retro-fetishism's opposite; its contributors impart on the original material some of their own individual aesthetics, even as their reworks never lose sight of the reverence for Judd that was the initial catalyst for the project. Equally, in the context of Interpretations, Judd's early electronic music functions as more of a binding agent than one might expect. These varied versions expose the similarities as well as the differences between their creators, thereby tracing a direct lineage between early and current experimental music. Far from crudely shoehorning Judd's music into their own stylistic blueprints, the interpreters instead reimagine it outside its strict televisual functionality in favour of something more amorphous and free, sharing a genuine passion for Judd's labours. It's clear that the artists involved in Interpretations felt personally close to Judd when reimagining his music. 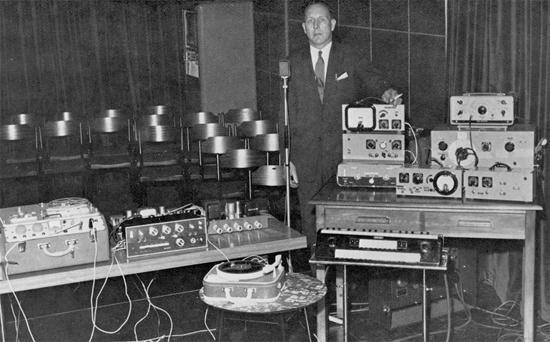 Edwards calls Judd's experiments with oscillators and tapes a "noble struggle" against both technological limitations and the more practical constraints of funding, and Herndon agrees. "There is something really fascinating about FC Judd as an artist," she says, "I won't pretend there is not some romance to how committed he was." Whether Judd's interpreters deploy Max patches or oscillators is less important than their experimental tendency, a shared will to "strike an alien chord", as Alex Wilson puts it. For all their differences, running through the interpretations is what Alex calls "the soul of our Fred. And that's what's important; he's never far away from any of these tracks. [The contributors] are truly wonderful folk who believed in what Fred represented. Kindred Freds." Interpretations On F.C. Judd is out now via Public Information. For more information and to buy the record, click here to visit Public Information's website. Tomorrow, May 30th, Manchester's Islington Mill will play host to a compilation launch party - Pye Corner Audio, Karen Gwyer and Ian Helliwell - plus Massonix and Public Information DJs. Click here for information and tickets. The Bristol launch party for the compilation takes place on 7th May at the Cube Cinema, and features eMMplekz (aka the dream-team hook up of Baron Mordant and Ekoplekz), Bass Clef under his Some Truths pseudonym, Karen Gwyer and Vessel & El Kid, who will "deconstruct F.C. Judd live with laptop/drum machine + FX". Information and tickets here.